This was submitted to me for World Prematurity Awareness Day. I was so moved I sent it to Beverly at March of Dimes, who organised this inaugral day. She agreed with me that it was amazing and she shared it on Thursday. I wanted to share it here for those who may have missed it, in its entirety. My girl needed me 6 times during the long night. Seizures, spasms, pain, breathing problems. Today we drive some distance to a hospital big enough to handle her complexities and instability for what in other children would be fairly minor surgery. For my girl any intervention is fraught with fear and trepidation – from family, friends and professionals alike. Our local hospital could not accept her admission onto the regular children’s wards, because they were too far along the corridor from HDU, which she can need at a moment’s notice. Surgeries are carried out in major hospitals with access to ITU care. My girl was born in Africa at 26 weeks. We don’t know what she weighed, nobody bothered to check. We do know she had a 1 minute APGA of 8. Then she was put outside on a table to die. After 6 hours they realised she was still breathing and ventilated her. In a shared crib. After 5 weeks she was sent home to die, in order not to clutter up the hospital. Shocking? Yes, but not so very far adrift from many preemies’ arrival all round the world. Including ‘western’ preemies. We gild over the treatment perhaps by not actually putting them outside, or ‘allowing’ their parents to hold them during their un-necessarily last minutes. But is it so different? My girl’s determination, strength and character shine through all of this. 6 years later she has a list of diagnoses that scare many medical professionals. 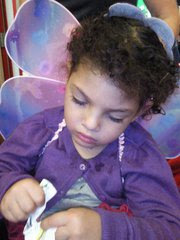 She attends mainstream school, and speaks or understands several languages. She defies the odds at every turn. And yet our frequent blue-light rides in her ‘special van’ terrify us every time. When she’s lying blue-grey on the floor and I can’t find her pulse – again – I am at my most distraught. When she recovers I am angry angry angry. A note for the medics - don’t cross me on those days. When she’s lying in resus or HDU with a GCS scoring in single figures and I whisper songs in her ear, cradling her in my arms to hold any part of her I can - as if my touch will somehow reach her wherever she is and anchor her to me - while the medical team work over her, sometimes as many as 6 at a time, I feel as if my own heart is skipping beats along with hers. One time when the furore was over, I whispered to her ‘thankyou my honeybee for coming back to me’. Her beautiful eyes flickered open and she whispered back ‘welcome mumum’ and slipped back to her ‘altered state of consciousness’. My girl wants to be a dancer. A chef. A paramedic. She wants to build houses and paint. She wants to walk like her friends. She wants her body to work properly. She wants to be able to feed herself. To have a wash by herself. And a thousand other little-huge dreams. She roars with frustration and anger, then reaches deep and finds the strength to try again and again and again. I learn from her. I learn most of all to share a love of life lived in the moment, all the while holding onto dreams of the future. Dream big and aim high. Meanwhile do what you can today. My girl has taught me this. This blog has taken on a direction of its own. I was going to write about the poignancy of driving miles to a hospital that hopes it can cope with her needs, on world preemie day. I was going to stop harping on about the history and the past. But while our babies are still demanding to come early into the world, their stories need to be told. Over and over again, until the unaffected world leaders begin to listen and hear their (silent) shouts for equity. For the care and attention that should be their birthright, their due. For the tables and waiting places to be taken away for ever. For their ongoing needs to be addressed and supported. For proper research, at the point of prematurity and on and on into the future lives of the ‘unlucky’ ones. Because yes, some come away unscathed. The few and far between ones. The lucky ones. Their terror journey has ended. For so many of us, the rollercoaster will continue to an unthinkable ending.